We are back in the full swing of school. I've gotten a few emails about Gattegno's Mathematics Book 2 - where is he going with this and why are we doing addition and subtraction the way he does it? I thought I'd take the next couple blog posts and go over textbook 2 with a mile high view: share the main concepts, discuss where it's headed and maybe it will make more sense to folks who are tempted to teach the addition and subtraction portions the "normal way". What is Gattegno up to in book two? He is still teaching algebra and he's still focused on the symbols: the study of the symbols, the rules for using the symbols, and the student's flexibility with the symbols. For Gattegno, it's always about algebra - always. If you are a parent coming at this from a traditional math point of view, Gattegno will look like slow going. But it's not. Actually, there is a lot of a traditional Algebra 1 course that can be taught right alongside Gattegno's Mathematics book 2 and we do just that. Number sense and number talks are all the rage in the public school system right now and for good reason. We've been terrible at teaching math for the last 100 years. So, number sense is the "new" kid on the block and so are number talks. This video by Jo Boaler describes our current predicament. What I love about the video above is that Jo nails the problem with how we teach mathematics in the early grades and approach remediation. If students cannot use numbers flexibly, we focus on more counting and on the memorization of individual facts that have no connection to other facts. I'd extend what Jo calls known facts to "known algorithms". For instance, my favorite whipping boy, the standard algorithm for subtraction which involves borrowing and regrouping. It's a terrible algorithm, it never needs to be used and it's time consuming and prone to errors. And it tortures small children. When a parent comes to Gattegno's Mathematics Book 2, it will look like Gattegno is teaching number sense. He isn't. In fact, he said, "The teacher looks after the symbols, the understanding [of numbers] looks after itself." I think what Gattegno meant is that the teacher makes a study of the symbols and the rules for manipulating the symbols, and the number sense follows behind naturally. Or what Jo calls the ability to break apart and recombine numbers to make problems easier. What is breaking apart? Subtraction, fractions, and division. What is recombining? Addition and multiplication. All of that work done in book one was the study of the symbols and the rules for manipulating them. We gave children an introduction to the symbols to begin mastering them without having to deal with calculating. The calculating, when one knows how to take apart and recombine numbers, look for patterns, and all the rest, isn't that hard. We used letters and worked on numbers inside of 20 for three years from pre-k-1st. In the course of a week we moved from numbers to 20 to numbers to 1,000,000. What were we able to do with those numbers? Add, subtract, find reciprocals, fractions and multiplication. Once a student gets the symbols down and understands the patterns for how numbers are made, the rest is easy. So what's happening in Gattegno's Mathematics Book 2? What are the big ideas in this book? The way that Gattegno teaches addition and subtraction is a focus on place value. Why would Gattegno do this? If you watched Jo Boaler's video above, she equates the student's ability to manipulate numbers to create easier problems with a child's success in mathematics and is actually learning the easiest form of mathematics. The student who understands the algebra behind manipulating place value can do things in math that seem like magic. Gattegno puts a lot of emphasis on what I call All From 9 the Last From 10. All from 9 last from 10 shows up over and over again. 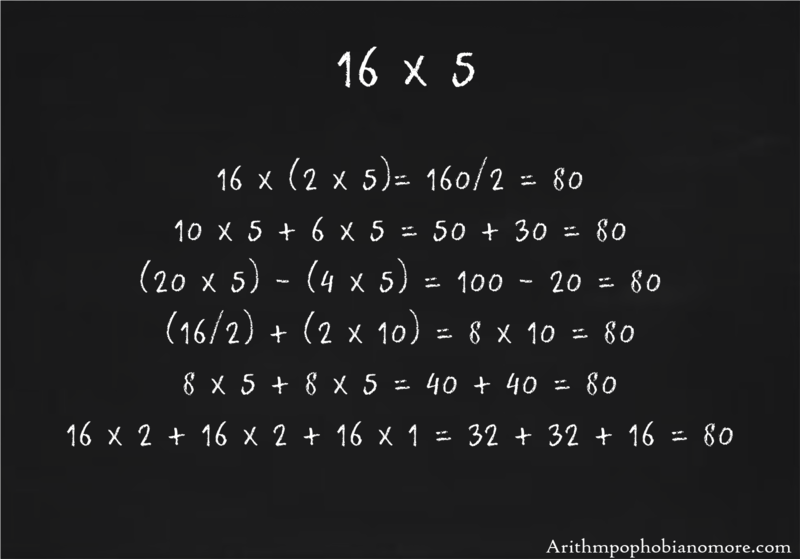 How do you solve 16 x 5? Depends. Maybe it depends on how you feel today. It might depend on your known math fact recall, it might depend on whether you have paper and a pencil in front of you. Do you need the fact in a hurry or are you playing with patterns? There is no "right" way to solve this problem. And context is everything. I saw a YouTube video recently that said that 7-8 year old students are not abstract enough thinkers to do this kind of work. That is nonsense. They can talk - language is way more abstract and difficult than breaking apart numbers and rearranging them. The distributive property allows students to do all kinds of crazy manipulations of numbers. It's unfortunate that most teacher's don't see the beauty of the distributive property and how a thorough understanding of it makes nearly every multiplication problem easier and makes short work of fractions and formal algebra problems. The Distributive Property has a twin named FACTORING. These two concepts appear side by side in this book. It's not enough to know what factoring is, students will learn how to use it to make problems easier to solve. The skills of halving, doubling, and tripling is a fresh breeze on a hot day. Did you know that there is only one math fact on the times table that needs to be memorized? 7 x 7 and that's it. It's the only fact where there isn't a pattern and you can't get to it by halving, doubling or tripling. I suggest that you work on halving, doubling and tripling before you have your kids memorize the times table. If you choose to have them do it at all. We will be memorizing the times tables - it makes seeing patterns easier. But I know students who are very bad at memorizing and their parents think this takes them out of the mathematics game. That is simply silly. If I had to choose between a child who can manipulate numbers and child who is a good memorizer, I will take the student who can manipulate every time. Eventually, the memorizer will run into trouble. Even if you don't choose to use halving and doubling, students only NEED to memorize through the 5's times table. A thorough understanding of the distributive property will give you the rest. What Gattegno is not doing in his second textbook: he is not providing a single algorithm for solving addition, subtraction and multiplication problems. We aren't teaching number sense - though that is what happens. We are teaching algebra from the very beginning and in everything we do. Students learn to use the symbols and the rules for using the symbols to manipulate numbers and variables. We aren't trying to make kids do it the "right" way. There isn't a "right" way. There are ways that are more or less efficient, there are ways that will make the student less prone to mistakes, there are ways that work in only a few situations, but not across all of math. And there are definitely wrong ways. We want the kids to find the right tool that fits them and the challenge in front of them.